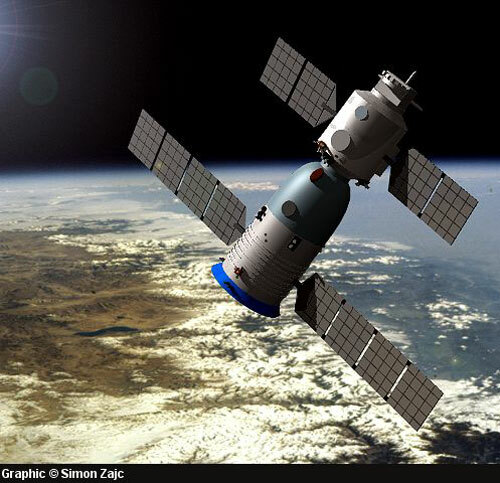 Space Safety » Archive » Spaceflight » Rendezvous and Docking » Can the Shenzhou Dock to the ISS? International Docking System Standard schematics (Souce: http://internationaldockingstandard.com). Although Russia and the U.S. have used different types of docking mechanisms over the years to link spacecraft in orbit, photographs of Shenzhou indicate that the Chinese have chosen a Russian variant called the APAS-89. The device consists of a pressurized tunnel 80 centimeters in diameter surrounded by sloping metal petals that allow any two units of the same design to latch together. Originally developed by a US-Soviet team in 1973-1975 for the Apollo-Soyuz Test Project and perfected for use by Buran space shuttles visiting the Russian Mir space station [which never happened, although one visiting Soyuz vehicle was equipped with the system], the APAS-89 is now used to dock NASA’s space shuttles to the International Space Station (ISS). Although China is primarily interested in docking its spacecraft with its own small space stations, the decision to employ the APAS-89 mechanism would allow Shenzhou to link with both the space shuttles and the ISS. Its Service Module, for example, has four main engines, whereas Apollo’s service module had only one, and Soyuz has one main and one backup engine. Also, Shenzhou’s large solar arrays generate several times more electrical power than the Russian system. And unlike Soyuz, the Chinese orbital module carries its own solar panels and independent flight control system, allowing it to continue as a free-flying unmanned mini-laboratory long after the reentry module has brought the crew back to Earth. […] So despite superficial resemblances and widespread news media allegations, the Shenzhou is in no way merely a copy of the Russian Soyuz – nor is it entirely independent of Russia’s experience or American experience. So in principle, the Shienzhou can dock to the ISS, and hopefully one day it will, opening a new chapter of international cooperation. Yet, China has first to achieve mastery over rendezvous and docking, as it is planning to do with the Tiangong-1 space station module. Secondly, a rendezvous and dock with the ISS would need to be approved by the safety panels of the ISS partners, a process that could take several months, as is is happening with SpaceX Dragon, whose plan to dock to the ISS is still awaiting for approval. The docking system of the Chinese spacecraft, which can be seen in the video below, shows clear resemblance with the International Docking System Standard. Some corrections. APAS is NOT IDSS compatible. A IDSS compatible docking mechanism like the NASA Docking System could not dock to APAS or vice versa. The International Docking System Standard (IDSS) is not yet in use on the ISS and won’t be until the launch of the first International Docking Adapter (IDA) in 2014. The second one is planned to be launched in 2015. The IDSS did no exist in 2004. If you have any questions I’ll be happy to answer them.